This Space Wold Lord is a classic 'Eavy Metal paint job. Super crisp, bright, and precise. It's a painting style that is immediately associated with GW and is something I feel like is disappearing from the painting scene recently in favor of more desaturated and subtle paint jobs. 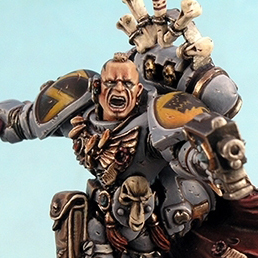 This guy really looks like he belongs in the Space Wolf codex. The colors are a classic choice too, belonging to Ragnar's company. The conversion is one I have seen variations of a few times, but it really works. 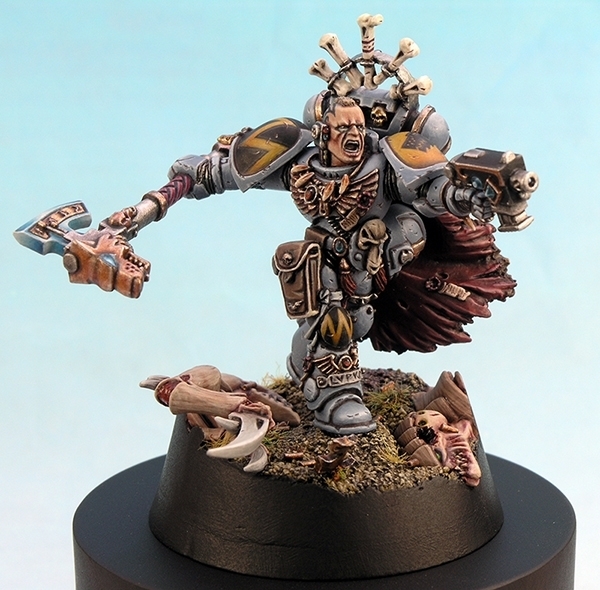 The body is the Khan from the White Scars with a bunch of Wolf bits all over it. The base is nice, but simple, giving this guy a real sense of place. Overall it's a fantastic conversion, one so great that it's hard to tell it not an official model.